During a recent Auxano All-Staff call, founder Will Mancini brought up a conversation that he, Auxano Managing Officer Jim Randall, and noted church consultant George Bullard had that revolved around a book by Jim Collins – How the Mighty Fall – and its relevance to church and denominational settings today. This post from 2011 came to mind, so I’m reposting it. 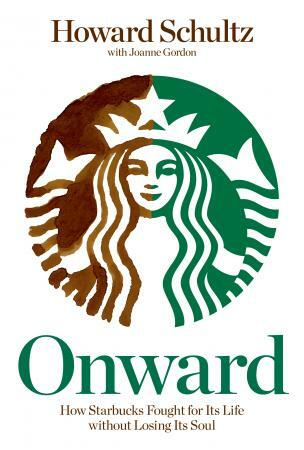 Starbucks’ battle back from mediocrity is well documented in CEO Howard Schultz’s 2011 book Onward. Pairing it with Jim Collins’ 2009 book How the Mighty Fall gives ChurchWorld leaders a sobering lesson in how to handle success. Great enterprises can become insulated by success; accumulated momentum can carry an enterprise forward, for a while, even if its leaders make poor decisions or lose discipline. Stage 1 kicks in when people become arrogant, regarding success virtually as an entitlement, and they lose sight of the true underlying factors that created success in the first place. When the rhetoric of success (“We’re successful because we do the specific things”) replaces penetrating understanding and insight (“We’re successful because we understand why we do the specific things and under what condition they would no longer work”), decline will likely follow. If not checked, success has a way of covering up small failures, and when many of us at Starbucks became swept up in the company’s success, it had unintended effects. We ignored, or maybe we just failed to notice, shortcomings. We were so intent upon building more stores fast to meet each quarter’s projected sales growth that, too often, we picked bad locations or didn’t adequately train newly hired baristas. Sometimes we transferred a good store manager to oversee a new store, but filled the old post by promoting a barista before he or she was properly trained. As the years passed, enthusiasm morphed into a sense of entitlement, at least from my perspective. 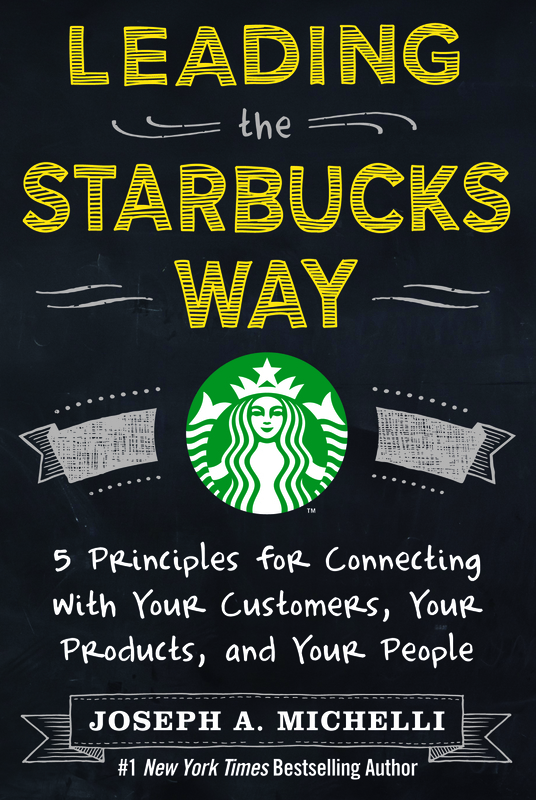 Confidence became arrogance and, as some point, confusion as some of our people stepped back and began to scratch their heads, wondering what Starbucks stood for. In the early years at Starbucks, I liked to say that a partner’s job at Starbucks was to “deliver on the unexpected” for customers. Now, many partners’ energies seemed to be focused on trying to deliver the expected – mostly for Wall Street. Great organizations foster a productive tension between continuity and change. 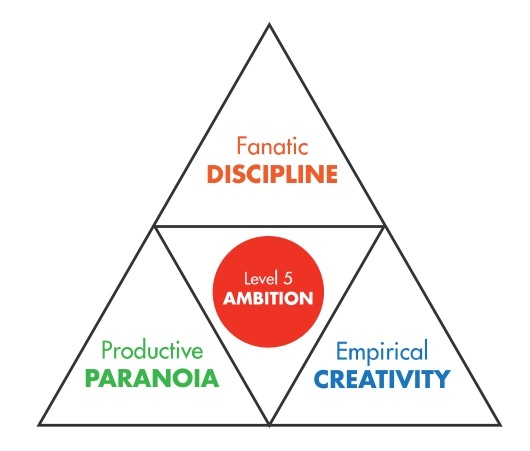 On the one hand, they adhere to the principles that produce success in the first place, yet on the other hand, they continually evolve, modifying their approach with creative improvements and intelligent adaptation. When organizations fail to distinguish between current practices and the enduring principles of their success, and mistakenly fossilize around their practices, they’ve set themselves up for decline. 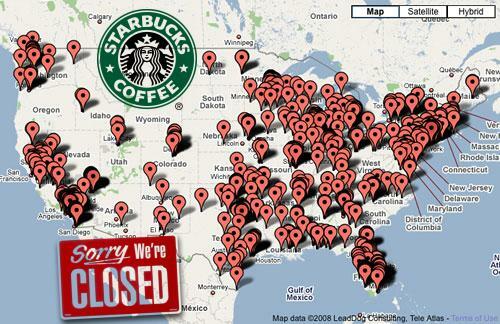 By confusing what and why, Starbucks found itself at a dangerous crossroads. Which direction would they go? Is your organization locked in on your vision, core values, purpose, and culture? Or do you move in first this direction, then that, just to have “success”? Beware the unintended consequences of success. During a recent Auxano All-Staff call, Auxano founder Will Mancini brought up a conversation that he, Auxano Managing Officer Jim Randall, and noted church consultant George Bullard had that revolved around a book by Jim Collins – How the Mighty Fall – and its relevance to church and denominational settings today. This post from 2011 came to mind, so I’m reposting it today. Here’s a quiz for you: What does this list of companies have in common? Xerox. Nucor. IBM. Texas Instruments. Pitney Bowes. Nordstrom. Disney. Boeing. HP. Merck. Every one took at least one tremendous fall at some point in its history and recovered. In every case, leaders emerged who broke the trajectory of decline and simply refused to give up on the idea of not only survival, but of ultimate triumph despite the most extreme odds. Circumstances alone do not determine outcomes. We are not imprisoned by our circumstances, our setbacks, our history, our mistakes, or even staggering defeats along the way. We are freed by our choices. The signature of the truly great versus the merely successful is not the absence of difficulty, but the ability to come back from setbacks, even cataclysmic catastrophes, stronger than before. Great nations can decline and recover. Great companies can fall and recover. Great social institutions can fall and recover. And great individuals can fall and recover. As long as you never get entirely knocked out of the game, there remains always hope. A major source of Collins’ inspirations has been Winston Churchill, a lesson in life of how the mighty fall – and come back stronger than ever. One of his most famous and inspiring speeches occurred in the darkest days of World War II. Collins adapted and expanded it for his closing remarks in “How the Mighty Fall.” With apologies to both Churchill and Collins, here is a modification of that same speech for the church. Never give in. Be willing to change tactics, but never give up your vision. Be willing to end failed ministry ideas, even to stop doing things you’ve done for a long time, but never give up on the idea of building a great church to reach people for God. Be willing to change the way you do ministry, even to the point of being almost unrecognizable with what you do today, but never give up on the principles that define your church’s vision. Be willing to embrace the inevitability of creative destruction, but never give up on the discipline to create your own future. Be willing to embrace loss, to endure pain, to temporarily lose freedoms, but never give up faith in the ability to prevail for the cause of Christ. Be willing to work together with other churches, to accept necessary compromise in the areas of non-essentials, but never-ever-give up your core vision and values. Failure is not so much a physical state as a state of mind; success is falling down, and getting up one more time, without end. Jim Collins, teacher to companies around the world and best-selling author (Good to Great, Built to Last, How the Mighty Fall, and Great by Choice) speaks and writes about it frequently. Tom Peters, consummate speaker and game-changing author (The Search for Excellence, Re-imagine, The Pursuit of WOW!, and The Little Big Things) doesn’t just speak on the subject – he rants about it. Steven Covey, business consultant, professor, and author (The Seven Habits of Highly Effective People, First Things First, and Principle-Centered Leadership) made it the foundation of his time management principles. Richard Swenson, physician-futurist, award-winning educator, and best-selling author (Margin, The Overload Syndrome, and In Search of Balance) thinks it is one of the keys to restoring balance in our lives. …especially for such an innocuous thing. 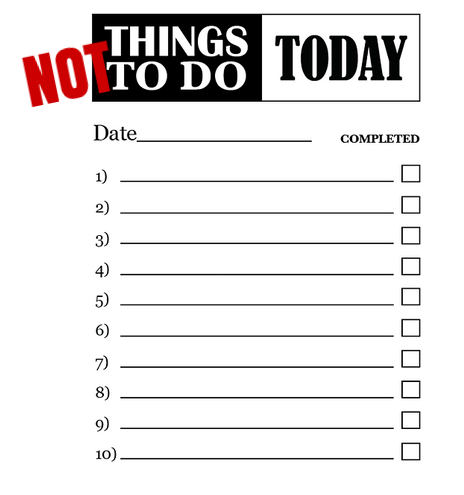 The top of your “to-do” list for today is to immediately begin working on your “to-don’t” list! Take a look at almost any decision-making reference in a book or magazine and what do you see? Most likely a matrix with one desirable feature across the top and another down the side. Conventional wisdom says you read the matrix in straight lines – you have to choose which feature you’re going to favor. What if you chose both? We’ve moved from an either/or past to a both/and future. One of the skills that defines an entrepreneur and an innovator is the capacity to generate new lines of sight. That mean looking at problems along a new dimension. It means rejecting old either/or choices and finding new both/and combinations. It’s like the game of chess. Most of the plays involve moving pieces forward or backward or sideways. But the bishop? It’s a game changer because it moves on the diagonal. Now you have the ability to move across and up on the board at the same time. You have changed the geometry of choice with one move. How are you going to put into practice the skill of making “both/and” decisions in your organization today? 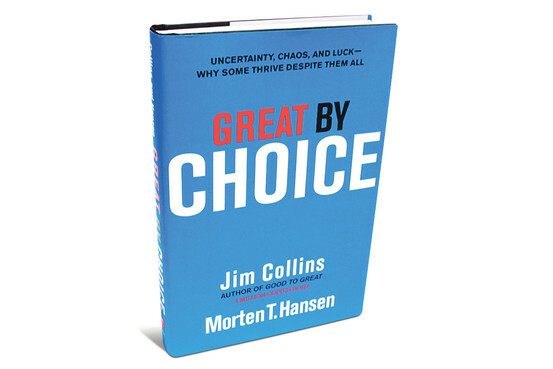 Today marks the final post this week on Great by Choice, the recently released book by Jim Collins and his colleague Morten Hansen. In much the same way as Collins’ previous works (particularly Good to Great), Great by Choice is written to a business leader audience using primarily business examples – but it is dead-center must reading for leaders in ChurchWorld. Here are Collins’ and Hansen’s summary thoughts on the final principle in the book, Return on Luck. (3) the event has some element of unpredictability. 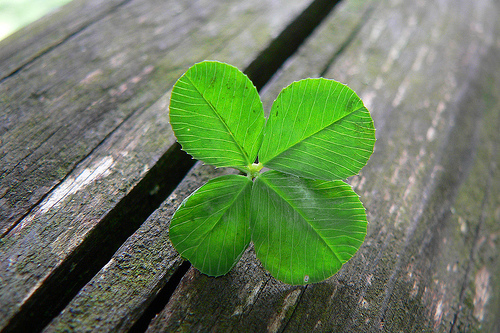 Luck happens, a lot, both good luck and bad luck. Every company in the research experienced significant luck events in the era of analysis. Yet the 10X cases were not generally luckier than the comparison cases. The 10X companies did not generally get more good luck than the comparisons. The 10X companies did not generally get less bad luck from the comparison. The 10X companies did not get their good luck earlier than the comparisons. The 10X companies cannot be explained by a single giant-luck spike. Poor return on bad luck. 10Xers credit good luck as a contributor to their success, despite the undeniable fact that others also experienced good luck, but the never blame bad luck for setbacks or failures. “Who Luck” – the luck of finding the right mentor, partner, teammate, leader, friend – is one of the most important types of luck. The best way to find a strong current of good luck is to swim with great people, and to build deep and enduring relationships with people for whom you’d risk your life and who’d risk their lives for you. Collins and Hansen have answered that question with solid principles, based on nine years of research and interviews. The following are the authors’ comments on SMaC. SMaC stand for Specific, Methodical, and Consistent. The more uncertain, fast-changing, and unforgiving your environment, the more SMaC you need to be. A SMaC recipe is a set of durable operating practices that create a replicable and consistent success formula; it is clear and concrete, enabling the entire enterprise to unify and organize its efforts, giving clear guidance regarding what to do and what not to do. A SMaC recipe reflects empirical validation and insight about what actually works and why. productive paranoia (for sensing necessary changes). Amendments to a SMaC recipe can be made to one element or ingredient while leaving the rest of the recipe intact. Like making amendments to an enduring constitution, this approach allows you to facilitate dramatic change and maintain extraordinary consistency. Far more difficult than implementing change is figuring out what works, understanding why it works, grasping when to change, and knowing when not to. What is your SMaC recipe? Is it still valid, or does it need amending? Continually question and challenge your recipe, but change it rarely. The authors use a real story (two different climbing teams’ assault on Mt. 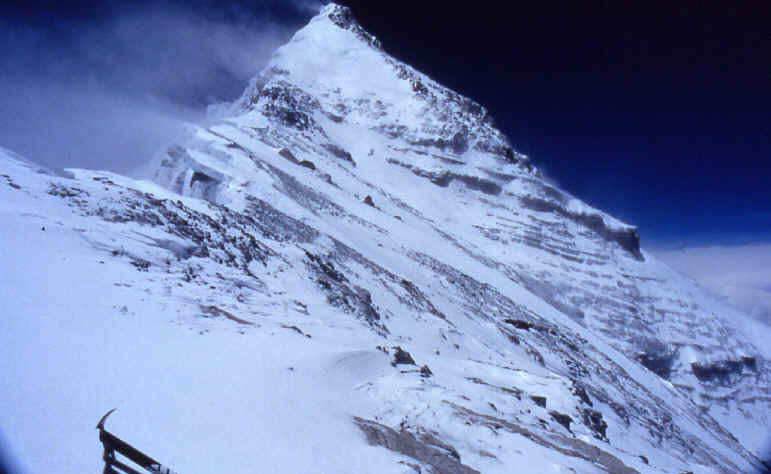 Everest in 1996; one succeeded, one had a tragic ending) to illustrate the concept of productive paranoia. Build cash reserves and buffers to prepare for unexpected events and bad luck before they happen. Bound risk – Death Line risk, asymmetric risk, and uncontrollable risk – and manage time-based risk. Zoom out, then zoom in, remaining hypervigilant to sense changing conditions and respond effectively. 10Xers understand that they cannot reliably and consistently predict future events, so they prepare obsessively – ahead of time, all the time – for what they cannot possibly predict. They assume that a series of bad events can wallop them in quick succession, unexpectedly and at any time. It’s what you do before the storm hits – the decisions and disciplines and buffers and shock absorbers already in place – that matters most in determining whether your enterprise pulls ahead, falls behind, or dies when the storm hits. 10Xers build buffers and shock absorbers far beyond the norm of what other do. The 10X companies studied carried 3 to 10 times the ration of cash to assets relative to the median of what most companies carry and maintained more conservative balance sheets than the comparison companies throughout their histories, even when they were small enterprises. 10Xers zoom out, then zoom in. They focus on their objectives and sense changes in their environment; they push for perfect execution and adjust to changing conditions. When they sense danger, they immediately zoom out to consider how quickly a threat is approaching and whether it calls for a change in plans. Then they zoom in, refocusing their energies into executing objectives. While you might not face the same circumstances in ChurchWorld as in the business world (especially in terms of generating revenue), you have a risk profile just as any business does. Take a look at the environment around you – how much time before the risk profile changes? What have you done to get ready for it?